(Metric and US units) This program will help you design single or adjacent footings, wall footings, spread footings and a lot more. You can adjust the way the program reviews the data to fit whatever code requirements you are working to. This feature allows input of a column load and column moment, placed on a rectangular footing. The output provides soil bearing pressure, footing stresses and required reinforcement. This feature allows input of a uniform wall load and moment. The output provides soil bearing pressure, footing stresses and required reinforcement. 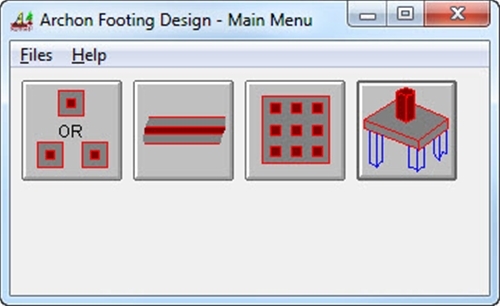 This feature allows input of a single large rectangular spread footing with multiple column loads. The program uses slab on grade methods for analysis. The output includes soil bearing pressure, footing stresses and required reinforcement. This feature is based on input that describes piles supporting a spread footing. The input includes multiple column loads. The output provides the loads on the individual piles.